Bradley Cooper has shown time after time how worthy of a performer he is. Many will agree that the Pennsylvanian native is one of the best actors working today. And, his producer credits show audiences he isn’t afraid to challenge himself. American Sniper, Clint Eastwood’s latest film and produced by leading star Cooper, is another example of how strong the actor is. Not only is his performance as real life war sniper Chris Kyle excellent, but he’s essentially the glue that holds the film together. From one important actor to another, Eastwood has an expansive and influential history. Although recently, the filmmaker has shown how he may be losing some of his touch when it comes to exploring humanistic psychology. Eastwood’s emotional drama tends to ferment into superficial melodrama, which takes away from the seriousness in a scene. Enter Cooper. Whenever Eastwood is increasing the emotional volume in an upsetting or crucial situation, his leading star has the ability to balance the movie out. Therefore, the audience can reasonably adjust with American Sniper’s display of societal disconnect involving a faithful soldier struggling to decompress. This may suggest that Cooper comprehends the film’s subject better than his director can. Nonetheless, when the movie lets us in, we can’t pull ourselves away from Kyle’s life. American Sniper also has a supporting cast who are all capable in their designated roles. Whenever they’re sharing the screen with Cooper, they seem to grow more confident. Again, the audience’s investment grows stronger. What caps the beneficial experience off is Eastwood’s understanding of the manic angst and fear that takes place on a battlefield. Scenes featuring Kyle looking through his gun’s scope are nerve-wracking as he intensely grips on to his unbreakable patriotic promise to protect his country. And, Eastwood’s choice to capture climactic gunfire through a thick porridge of blowing sand throws the movie goer into the thunderstruck perspective of having your senses diminished while your life is on the line. Eastwood respects the perilous and disturbing life-or-death content, and refuses to paint them as anything that could translate to gratuitous action. American Sniper goes slightly overboard on letting its sound design evoke the feelings the audience should naturally be feeling, but otherwise the film usually stays in check. And, if this review sounds like more of a love letter to Cooper’s career, I can’t help myself. American Sniper and Clint Eastwood owe a debt of gratitude to the man. 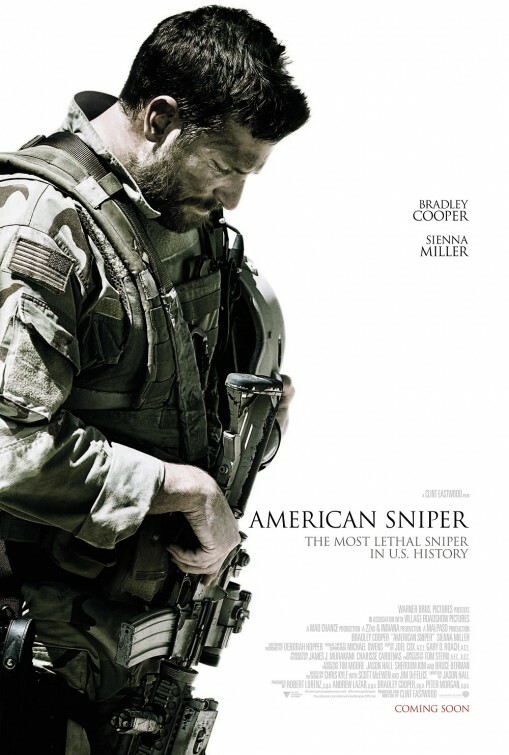 I can’t even begin to picture a Bradley Cooper-less American Sniper.